Jewellery - the gehena of a woman as they say, is indeed one of the most-prized possessions for every bride in our country. A woman takes pride in all the jewellery she wears, whether it’s for her wedding, sangeet or a cocktail. For some of us, our mothers start collecting these precious jewels all throughout our growing up years, some of us prefer to wear heirloom jewellery - passed down from generation to generation, while some prefer to keep up with what’s trending and opt for personalised pieces. With all of these options available, the challenge arises when one doesn’t know what kind of jewellery should be worn for which occasion - and what a task that is! 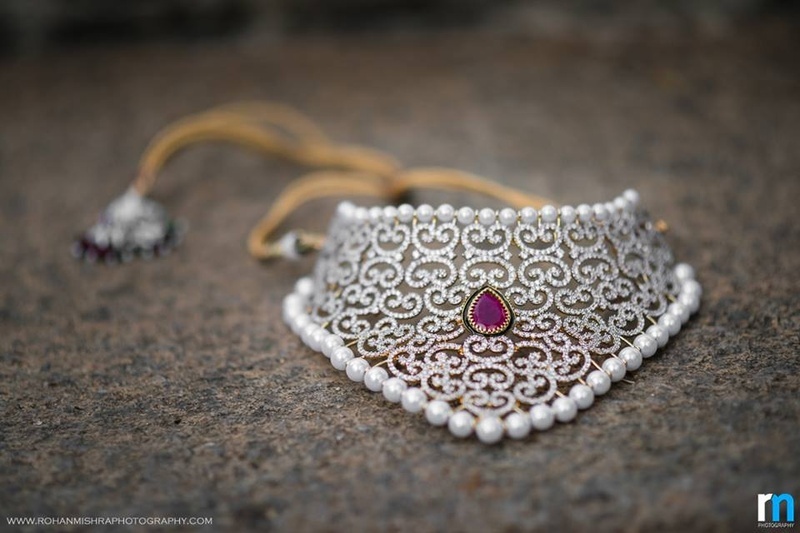 Is polki jewellery more appropriate for the sangeet or the wedding day? Should you wear a maangtikka at a cocktail party? Don’t you fret over it! We’ve got you covered with the right jewellery options, segregated ceremony wise, with tips, tricks and hacks you will love! Cocktails speak of elegance and class, so you don’t want to get too loud with multi-strand gold rani haars or bold polki necklaces. Opt for elegant diamond necklaces or statement jewellery studded with colourful gemstones - these adornments will perfectly complement cocktail gowns as well as lehengas. Bright colours, lively atmosphere, and all things pretty! Mehendi ceremonies give us the touch of Bollywood that we’ve always wanted. Keep the vibrancy up with the precious jewels you adorn. Pick jewellery sets that are studded with colourful gemstones or opt for pearls for chic freshness - every outdoor mehendi function will surely make these jewels stand out. An engagement is a “Mini Wedding” (as we like to call it); it an occasion where all eyes are on you! Camera flashes and the bright lights and decor should not dull out the jewellery you wear. Wear bold statement gold necklaces that are embedded with gemstones or go for multi-strand kundan studded chokers - whatever your pick, remember to keep it bold and beautiful! Sangeet is your way of showing the world that you could’ve made it big in Bollywood! And why only prove that with your dance moves? Let your jewellery speak as well. Loud, fun yet ethnic jewellery is what we recommend for this ceremony. Your most-awaited day comes with great demands where jewellery is concerned. But don’t sweat it; these designs will help you look like the classy, bold, beautiful woman you are. Since you’ve covered the ethnicity element well in all your pre-wedding ceremonies, why not opt for something a little different for your reception? Whether vivid or pastel, diamonds complement any attire. Round and marquise-cut diamonds as well as traditional polkis can add the perfect amount of elegance to your entire ensemble.